I confess that I’ve let some days go by without blogging. Unthinkable, I know, but I (gently) throw myself on the mercy of the JAZZ LIVES court of readers. Permit me to explain. From Thursday, September 15, to Sunday, the 18th, I was entranced by and at the Cleveland Classic Jazz Party. Consider these — randomly chosen — delights. Jim Dapogny playing IF I WERE YOU (twice) and some of his winsome original compositions. Rossano Sportiello, Frank Tate, and Hal Smith swinging like no one’s business. Rebecca Kilgore singing KEEP A SONG IN YOUR SOUL in the Andy Schumm-Hal Smith tribute to Alex Hill. Andy, on piano, with Paul Patterson and Marty Grosz — once on banjo! — in a hot chamber trio (a highlight being LOUISE). Wesla Whitfield in wonderfully strong voice. Dan Block and Scott Robinson romping through HOTTER THAN ‘ELL. A Basie-styled small band led by Jon Burr, offering (among other pleasures) IN THE WEE SMALL HOURS OF THE MORNING. A string bass trio — Burr, Tate, and Kerry Lewis — showing that no other instruments need apply. Harry Allen and Jon-Erik Kellso playing ballads, and Dan Barrett, too. Tributes to Nat Cole, Harry Warren, Isham Jones, and Bill Evans. Many videos, too — although they take some time to emerge in public. I came home late Sunday night and on Monday and Tuesday returned to normal (employed) life as Professor Steinman: John Updike, Tillie Olsen, William Faulkner. Tomorrow, which is Wednesday, September 21, I get on a plane to New Orleans for Duke Heitger’s Steamboat Stomp. Obviously I can’t report on delights experienced, but I can say I am looking forward to hearing, talking with, and cheering for the Yerba Buena Stompers, Miss Ida Blue, Banu Gibson, Tim Laughlin, Hal Smith, Kris Tokarski, Andy Schumm, Alex Belhaj, David Boeddinghaus, Ed Wise, Charlie Halloran, James Evans, Steve Pistorius, Orange Kellin, Tom Saunders, Debbie Fagnano, and many others. So there you have it. I could sit at home blogging, or I could be on the road, collecting gems, some of which I will be able to share. Posted in "Thanks A Million", Bliss!, Generosities, Ideal Places, Irreplaceable, It's All True, Jazz Titans, Swing You Cats!, That Was Fun!, The Heroes Among Us, The Real Thing, The Things We Love, Wow! 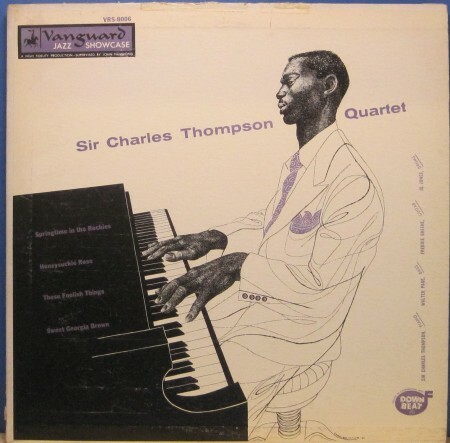 I offer as evidence one of my favorite recordings, another gem — issued by who-knows-what “authority” on YouTube, SWINGTIME IN THE ROCKIES by the Sir Charles Thompson Quartet — from one of the sessions supervised by John Hammond for Vanguard Records. Sir Charles, who is still with us in his nineties (born March 21, 1918) was joined by three angelic presences of rhythm — three-quarters of the original Count Basie rhythm section, Jo Jones, drums; Walter Page, string bass; Freddie Green, guitar, for this exploration of Jimmy Mundy’s swing classic, more usually encountered as a big-band performance. It all seems simple — and it goes by so quickly — but lifetimes of expert work in the field of swing are quietly on display here. Note, for instance, how the overall sound changes at the bridge of the first chorus when Jo moves from his cymbal to the snare head, padding and patting away. When they turn the corner into the second chorus (which, for Charles, has been a straightforward chordal exposition of the simple melodic line) we hear what set Charles apart from the great forebears, Waller, Basie, Wilson, Tatum, Cole, Kyle — his intriguing single-note lines which have a greater harmonic freedom than one might initially expect. (Look at Charles’ discography and you see early work alongside Charlie Parker, Dizzy Gillespie, Illinois Jacquet, Leo Parker.) Hear the bridge of the second chorus, and delight in Charles’ wonderful mixture of stride, Kansas City swing, and bebop: James P. Johnson meets Al Haig, perhaps. The Basie influence — paring everything down to its most flowing essence — comes out more at the start of the third chorus, with the theme simplified for the greatest rhythmic effect, as if a trumpet section was playing these chords. At this point I find it impossible to continue annotating because I am simply floating along on the music. But two things stand out. One is that all that I’ve described has taken around two minutes to be, to happen. That’s a rich concision, a conservation of energy. The other is Charles’ intentional use of space, to let us hear the three other players, who are — as they all know, not just subordinates but in some ways the Masters. Charles could certainly swing as a soloist but this is so much more fun. There’s a brief nod to CHRISTOPHER COLUMBUS at 3:04, but it’s just a nod: the pattern of joyous riffing on the opening and closing sections, alternating with single-line explorations on the bridge has been set. And I think — this is all surmise — that the four musicians did not spend more than a few minutes preparing. SWINGTIME IN THE ROCKIES is, except for the bridge, harmonically dense, so I can imagine Charles saying, “I’ll do four bars to start; you join in at two, and let’s do this as an ending — I’ll let you know how many choruses we want, and let’s do a take.” And I love the way the last chorus is an ornamented version of the first, with Jo returning to the hi-hat. I think I first heard this record thanks to Ed Beach on his Sir Charles program: this might have been forty years ago. SWINGTIME IN THE ROCKIES remains at the very apex of glowing inexhaustible swing. It is so reassuring to know that it was created and we can hear it again — to soothe and uplift and remind us of what is indeed possible. In one way, I think of having a book on the shelf with the most beautiful ode or short story, known and loved for decades, that we can always revisit simply by moving a few feet across the room. But I think the pleasure of SWINGTIME IN THE ROCKIES goes deeper, at least for me: it’s like waking up, seeing the sun, breathing the air, going to the kitchen faucet for a glass of cold water, feeling one’s needs filled. Listen. Charles, Freddie, Walter, and Jo create a small universe of motion and joy that reminds us of the dancing universe around us.